We already drew attention to the warnings beginning to be published, in May, about the ominous build-up at Campi Flegri, in Italy. 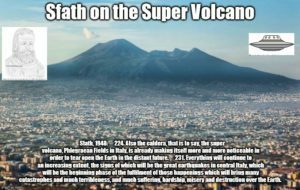 And the 1948 letter from Sfath forewarned of the devastating destruction coming to Italy from the earthquakes and volcanic eruptions, among many other specific things, worldwide. 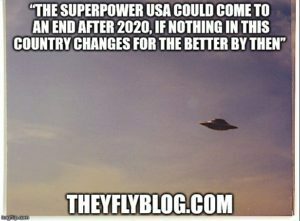 While there will still be no shortage of content online about UFOs, etc., it should be the last thing on one’s mind, especially since most of is time-wasting disinformation. There is, and has long been, one authentic contact case and its purpose has been to help us assure our own very threatened future survival. There will be no other contacts with extraterrestrials for a very long time. From this point on, in addition to pointing out the ever-fulfilling prophecies and predictions, the focus should be on the spiritual teaching and the keys it holds to our future survival. The spiritual teaching is the underlying reason for the Meier contacts, not for us to chase lights-in-the-sky, or to provide careers for so-called “UFO experts”. Making sure that the prophecies are fulfilled about America’s bringing complete destruction upon itself, more insanity has been subscribed to by Trump in the form of more… unwinnable war in Afghanistan. It’s obviously a generous gesture to keep the weapons and warring industries thriving – until we’re completely obliterated. While the specific, looming destruction in Italy (and other places) was first warned about in the Meier material 70 years ago, current updates and foretelling of the specific earthquakes are being done effectively by Dutchsinse, whose accuracy is literally putting the USGS to shame and rendering it useless at best. …refers to the eruption of Yellowstone, as also previously mentioned. Thanks to Norm DeCindis for the graphics! Couln`t agree more with you Andrew about this Dumb Trump. I don`t think Trump knows just what he is doing,hell he doesn`t think!!! Yikes what kind of a president is this,Trump just doesn`t even act nor behave like a president,yikes!!! So basically the “plan” they came up with would be to approach the magma chamber from the side (NOT through the caldera) and essentially use the magma chamber as the hot side of a heat pump. Assuming the plan actually occurs, and *if* they do it right, the water in the coolant loop wouldn’t necessarily have to come into contact with the lava chamber itself (i.e. closed loop) and the system would both cool the magma chamber (presumably reducing pressure) and act as a type of magma-assisted deep geothermal well. How that would play into Sfath’s description of the caldera opening as “unpreventable”, I don’t know. Good quote from 251. It would be good if they took the relatively simple advice regarding Cumbre Vieja, i.e. to grade down the western facing side. That one will blow, according to the Plejaren. Indeed, but it appears that they are too busy “debunking” the danger. What year was that warning given again? The first publication I can find on Cumbre Vieja collapsing is from 1999. If done correctly one would think could close down quite a few nuclear plants with this potential geothermal energy. While at the same time helping mitigate the energy and heat found within the Yellowstone, etc calderas. As far as have read, and the reality on the ground with erroneous beliefs within malevolent actions… Seems the caldera will long since have blown before we begin to listen and change towards the better. Well Corey remember what happened at Fukushima back on March 11th,2011. They did the same thing there with that nuclear power station to cool it down too and look where they are now? they can`t even get robots in there too cool down Fukushima ether! An impulse just came to me, being that Donald Trump has brought up taking presidency since the 1980’s. I’m starting to ponder if, he was impulsed by the Giza intelligence (and I’m not implying he was). Sorry I assumed it was common knowledge but apparently it isn’t. Hi Michael. I believe the war in Afghanistan is a ruse to hide the fact that the u.s. Govt. – CIA, NSA, need that country for opium which is processed into heroin and given to the mafia to distribute and take the profits to support problems in other countries. Hi John, I laughed when I found out back in the day Alberta used to have the biggest poppy fields in North America, now it’s illegal. In Afghanistan there were also videos of soldier types guarding the poppy fields and not only for heroin but also Oxycodon and Morphine as these too are derived from the crop. Do you realize how much of each is used every day, in every single hospital? Oxy is the best pain relief but leaves most addicted. People who are dying usually get morphine and almost always at the end, they get a little extra to put an end their suffering. But as you say it’s a huge money maker for these groups who are selling it. The Catastrophe Takes Its Unimpeded Course!